The simple answer is no, we don’t. We grow way more corn than we can eat or, once turned into alcohol, drink. We do feed a lot to animals, many of which subsequently end up as burgers or pork chops. But even after all that, and after accounting for exports, we still have a heck of a lot of corn to put to work. There are lots of industrial uses for this surplus corn, though, and chances are pretty good you’ve got an ear or two worth coiled up next to your 3D-printer, in the form of polylactic acid, or PLA. Whether a biopolymer is naturally occurring or synthesized industrially, the basic principles are the same. All polymers are made up of small, repeating units, called monomers, that are linked together chemically into long chains. A simple example of a non-biopolymer is polyethylene, where the monomers are the two-carbon alkene ethylene. The properties of the monomers, their numbers, and the configuration of the chains largely determine the characteristics of the resulting plastic, and the huge number of combinations of these factors leads to the incredible diversity of polymers in use today. While polylactic acid — which is more correctly styled “poly(lactic acid)” since the monomer is lactic acid — has come into widespread only relatively recently, its history stretches back to the 1930s. Unsurprisingly, it was yet another product the E.I. du Pont de Nemours Company’s sprawling research labs in Wilmington, Delaware. That it also was the brainchild of Wallace Carothers, the troubled genius responsible for Nylon and Neoprene, is perhaps a bit surprising, since those synthetic polymers were made from petrochemicals such as coal tar and acetylene. 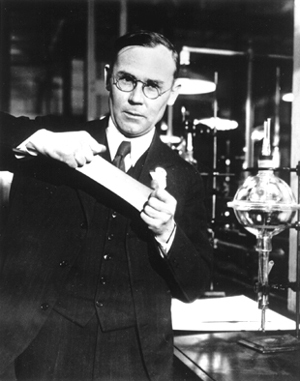 Carothers played with the synthesis and managed to make PLA in the lab, but he was never able to come up with a commercially viable process to produce it. PLA remained a niche polymer for decades, so much so that DuPont never even bothered to patent Dr. Carother’s invention until the 1950s. Work on making PLA into a product would pick up again in the 1980s. With images of the oil embargoes of the 1970s fresh in their minds and the need for an alternative to petroleum as a feedstock for the polymer industry, husband and wife chemists Pat and Sally Gruber attacked the PLA problem, often running trial batches on their kitchen stove. They were able to come up with a method of turning corn kernels into PLA in 1989. The first batch cost $200 a pound, but the process held promise. The commercial production process for PLA has been refined over the years, and the price per pound of PLA has dropped markedly. There are several paths to the finished resin, but it all starts with corn. The feedstock could actually be any starchy plant material that can be fermented, but given the vast piles of cornstarch produced in the USA, it’s the material of choice. The starch is fermented in huge tanks in a controlled manner so as to produce lactic acid rather than ethanol. 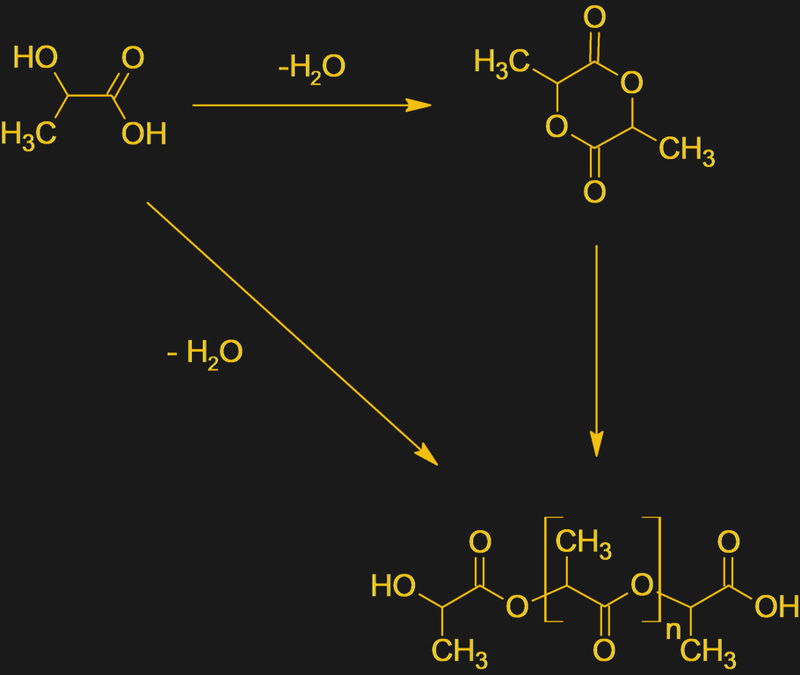 The lactic acid is either directly polymerized into PLA, or reacted with lactide, a cyclic molecule that looks like two lactic acids stuck together. The polymerization reaction produces water which must be removed either by a vacuum or by distillation. The resulting plastic is technically a polyester since the monomers are linked through ester groups. Commercially produced PLAs have a wide range of properties depending on the exact recipe used, but in general, PLA is classified as a thermoplastic. As the name implies, thermoplastics soften and melt above a characteristic temperature, solidifying again under that temperature. Thermosetting plastics, on the other hand, do not melt and just decompose above a certain temperature. Thermoplasticity is obviously important for 3D-printing filament, but it also makes PLA a candidate for replacing petroleum-based plastics in a wide range of applications. Another big draw (and sometimes drawback) of PLA is its biodegradability. Given enough time and under the right conditions, PLA will decompose back into lactic acid, whereas most plastic will persist in the environment for much longer. This makes PLA an attractive plastic for manufacturing items that are intended for disposal, like food packaging. Deli trays and wrappers for precooked meals are a big use for PLA. PLA is not only biodegradable, it’s also biocompatible. 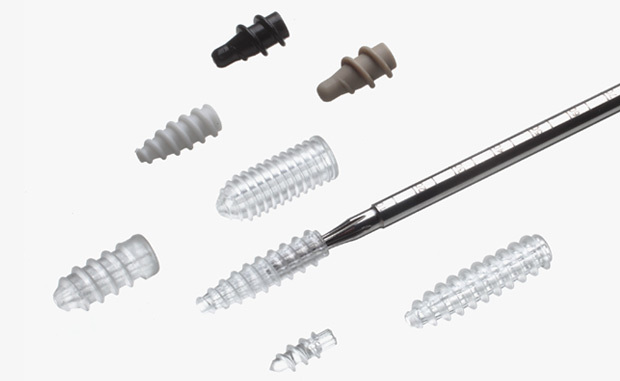 This makes the plastic a great choice for medical implants that are intended to be absorbed by the body. Depending on the application and the location in the body, PLA (more specifically PLLA, poly-L-lactic acid, made up exclusively of the L-type enantiomers of lactide) will take up to two years for the body to break down, during which time the appliance offers support and protection during healing or acts as a framework for new tissues to grow on. This property might be key to the vaunted future of 3D-printed organs. Given how useful the stuff is, it’s surprising how long it took for PLA to become commercialized. It seems to be a case of simple economics — while petrochemicals were cheap and plentiful, there was no economic incentive to develop alternative feedstocks. Once the proper environment was created and the right minds got to work on the problem, PLA became not only an acceptable substitute for other materials, but a genuine innovation in its own right with unique properties that go way beyond churning out a Benchy or some other bauble on a 3D printer. Throw it on the grill. Don’t even peel it. 20 to 30 minutes, depending on heat, turning a couple times. The kernels will be starting to brown. The husks folds back as a handle and the floss (silk) drops off freely. Simple and delicious. Add a bit of butter ( not margine) and salt, wrap in aluminium foil and put on the BBQ grill. Readiness is a bit of a hit and miss a fair, but ideally just a few kernels turn a little brown. Delicious. Rub a couple lime quarters into the corn and then sprinkle on a bunch of chili powder. Better than butter. You guys are talking about sweet corn. If you try to cook and eat the corn you see growing in most fields, you are going to have a very unpleasant experience. I’m not sure if the corn we grow in my country and the one you’re talking about are the same, but in my country we often eat the regular corn, but there’s a catch. You have to pick it before it’s fully “ripe”. When the kernels are still soft (in my country we say they are milky) it’s very delicious. This type of corn is eaten in the US as well, just usually not whole kernel or on the cob. It’s often ground up and either used as meal for making cornbread or hush puppies. It can also be ground into grits and boiled, which is a very popular breakfast in the southeastern part of the US. just eat it straight off the stock, dont even cook it. Cobs and all into the microwave for 5 minutes (or to suit). Chop half an inch off the stalk end and the leaves and silk come right off. Use a silicone mitt. Great when it’s too hot to boil a huge pot of water. PLA is a great material but it is very difficult to Form, at least on the style machines i am use to, Inline thermoforming machines. i have only seen a handful of our customers use PLA. UPL from a cactus is where its at. Good story, full of knowledge and insights. Not a hack but still one of the best and most technical articles on Hackaday in a while. The Grubers made a batch on the kitchen stove, I’d say that’s a hack! I agree – a really well written article. Thanks Dan Maloney! It would be great if someone made a plastic that could be made out of CO2 with ease. If you take any plastic (or anything with carbon in it) and burn it in a sufficient amount of oxygen you get CO2 and water. Going backwards, you are fighting against thermodynamics big time, so its unlikely. You could say that about any hydrocarbon. With advances in CRISPR and other support biochem processes it’s only a matter of time nature’s originating methods can anx will be well augmented to produce fast growing cellulosic like units (or others) for subsequent agglomeration into industrially viable plastics as well as feedstocks for bacteria to produce (diesel) fuels and others instead of alcohol (though I expect butanol very useful) the diesel one has been around for almost 10 years but, pretty much contained for security and IP issues – not least of which is the potential for release causing havoc in either its current form or mutated. Variants of this already well advanced for tougher plastics digestion, again under wraps in respect of IP and security/contamination issues. Its worth considering we have some 10 million bacterial species with an estimate some 100 new ones appearing each week to a month. Many of these older species mutated since humans are spewing out so many chemicals nature hadn’t seen before and other paths of recent new species continually mutating too, some intentional, thus offering huge permutations for evolution and at more than the obvious types of interactions too in terms of new symbiosis ‘collaborations’ with other organisms in completely novel structures. Let’s not forget how much ethanol for motor vehicles is made from corn [maize -Jenny]. Let’s not forget that leaded gasoline is much better for vehicles than corn is. Why did it take so long? I guess the petroleum lobby did its part in that, too. Did you know You can also make plastic from gelatine. Gelatine is made from waste products from the food industry. For example, from heavy rind and animal tissue. With the right additives, gelatine then becomes a food-safe plastic that cannot be distinguished optically and haptically from PP or PVC. It also does not soften when it comes into contact with water. But as I said… lobby-money. Far as I’m aware gelatine is only made from boiling up animal bones. Not suitable for vegetarians. Perhaps a vegetable version is possible, but is it still called gelatine? I’ve only ever seen “pork” and “beef” gelatine on food packaging. Which I check, because I’m vegetarian. I’m guessing that here in The States, we differentiate between gelatin and gelatine, the latter being “plastic explosive”. You are right. I hadn’t thought of that as a language problem. In German both is “Gelatine”. So is true but German is a language with less than half the words as English! of course you have to be a bit intelligent to get the words in context for example the German word Drucker is found in many very different places, on a Machine invoice for tech gear, and on almost every commercial building door! in one it is a dot matrix printer, on the other it means PUSH! why does the same word work? because in a dot matrix printer the ink is pushed on to the paper the root of the word actually means to push as it was explained to me by a German coworker during a business trip to Germany! @ Russ C. per https://en.wikipedia.org/wiki/List_of_dictionaries_by_number_of_words English has 171,476 .. 470,000 and German has 330,000 whereof 200,000 are in contemporary usage. The side-notes make for fascinating reading too. Please don’t forget that you can conjoin nouns in German and that both languages incorporate a huge number of foreign words. .. thus, as your claim is likely not from the universe i’m reading this site from, Hello Space-Cadet! Good thing you don’t have to eat the packaging. Yes, boiling bones and treating hide/rind with lye and boil the remains. AFAIK gelatine from vegetables is still called gelatine. That can be made out of algae but due to it’s properties, it cannot be made into a suitable plastic as far as I know. Gelatine can be cross-linked with formaldehyde and other “stuff” to get a non-solutable material. Why is it not suitable for vegetarians? We’re not talking about eating it. yes but you still have to kill an animal to get it. I think vegetarians generally try to avoid killing animals as well as trying not to eat them once they are killed. I think the the proper word is vegans. My understanding is that vegetarians, basically, don’t consume meat (although there are subgroups which may consume eggs and/or diary products). On the other hand, vegans don’t consume OR USE any animal product or by-product, like gelatin. Because it still needs the bioindustry and associated torture acts? It’s not just about eating. Out of curiosity, do consume sugar? Since sugar is from a plant source, it’s perfectly acceptable in a vegetarian’s diet. Of course, a person may avoid sugar for health or other reasons. Indeed dana, so many sugars and without their dietary moderators not conducive to overall health. Of course the bigger problem for vegetarians and worse for vegans is their mineral intake fsr less than for meat eaters, which can (and does in aging) affect the NMDA neural receptor causing unusual and arbitrary cognitive decline. The odd psychological aspect is the brains defenseman mechanism if you like is an intellectual challenge is interpreted emotionally the longer a vegan/vegetarian stays on that diet. I’ve known professional people at universities and industry over the past 40 years or so who used to be intellectually sharp but, become emotionally defensive as in ‘..dont feel like looking at that..’ in response to an issue within their professional training. Gelatin is indeed an animal product. I don’t see much point in making vegetable version of it. For culinary use, one can use other gelling agents such as agar (derived from seaweed) or pectin (derived from citrus peels, from what is left of an apple after making apple juice, etc.). For making plastics, there’s likely a more straightforward way, such as how PLA is made. Apparently there’s ongoing research into making synthetic gelatin, though, so some use must exist. It doesn’t save petroleum though; corn uses vast amounts of ammonia (from natural gas) and diesel to run the tractors and trucks. In the US it probably isn’t that much of a difference, given the vast use of anhydrous ammonia in agriculture, as it needs a hydrogen source, which is almost exclusively natural gas. Sure it’s not petroleum, but still a fossil fuel. What really surprises me is all the jack-off with so called biofuels, but very little use of CNG in the auto industry. Given how much natural gas the US has and the dominance of gasoline engines there (unlike in EU), it sounds like the right market for CNG. It burns cleaner, has a high octane rating (friendly to high-compression modern engines) and would be cheap over there. I used to have A CNG-fueled car. It ran fine, but the range on the “extended” tank was only 120 miles. I kept it for several years anyway, but finally gave it up when the US became a net importer of CNG during Bush-2. YUP, and if you think that’s low mileage its worse with ethanol try less than 1/3 the same mpg as gasoline! it has to do with the number of and type of bonds in the hydrocarbon being burned and gasoline has the most right type bonds than almost any other hydrocarbon useable as a fuel. Ah thermodynamics and chemistry! And as a side note we in this country burn enough fuel that if we wanted to use corn or any plant based fuel like ethanol its a loosing effort 1. there is not enough land area to grow enough corn or other crop in the USA to even supply 1/2 the required amount of fuel, and that means every farm national park your yard and all available bare dirt coast to coast ! 2. The lower energy density of the ethanol is bad enough but think of the process to make it you do the math I have seen it its ugly but to make the ethanol you must 1. boil the water to brew the “wort” (liquid that ferments to become “beer” which you must keep at a controlled temp in order to ferment it (heated or cooled building or tank), and even with some “SUPER” yeasts and some wizard brew master the best percentage alcohol yield is just less than 20 percent, if lucky more often its less than 12 % alcohol which means to get burnable useful fuel (it needs to be fairly water free not only to burn but to not destroy metal parts) you have to distill it AKA boil 100 gallons of liquid into steam to then get between 10 AND 18 GALLONS OF FUEL!! and that gives you a fuel that goes 1/3 the distance gasoline would so to replace 20 gallons gasoline you need at least 60 gallon’s alcohol which means boiling at least 3000 gallons of water not 1 time but at least twice! at least CNG is a “byproduct” of oil production and less effort and energy is required to use it! and hey even if my numbers are a bit off the concept is right, not really economically feasible folks! The 1/3 milage problem would be solved if all the citizens of the US decided to drive reasonably economical cars like most countries in the EU, rather than the gas guzzling ‘trucks’ that they do. Not so fast. PLA is hardly biodegradable in any practical sense. It needs very specific conditions to biodegrade – a temperature of 140+ degrees in a mix of oxygen and organics. This means an industrial composting facility; otherwise, it will continue to cause the same devastation in oceans and landfills as any other plastic, for many centuries. We need our Green Chemists to keep cooking, and there are a lot more promising prospects than corn as the feedstock. I can’t see any reason why a lot more of the current packaging for perishables isn’t made of PLA. I don’t see it anywhere though, polyethylene, polypropylene and polycarbonate seem to dominate, and these just seem to end up filling the ocean with plastic crap. I always thought that PLA was made from milk, given its name. Is any actually made from milk? Do the same thing with the milk, but adding baking soda, and you have a fine casein glue for your woodworking projects; just like the original Elmer’s Glue when I was a kid 60 years ago. That amorphous glass thing is a myth. Never heard it likened to plastic before. But in any case, it’s not true. Yes, the reason glass vessels in museums or old research facilities is thicker on the bottom is because of the way glass was manufactured/blown back then. Anyway, one of my favorite books is, “How we know what isn’t so” by Thomas Gilovich. https://www.amazon.com/How-Know-What-Isnt-Fallibility/dp/0029117062 I’ve read this book more than once, but I still get corrected once in a while. I got the idea that glass can fall under the classification of “plastics” from a Chemistry class I took back in the ’70’s. (It was actually in the text book.) Of course, if they can reclassify Pluto as a non-planet, and by doing so making my Astronomy knowledge obsolete, who knows what may have happened in Chemistry? One of the reasons I hang out at hackaday is the tremendous pools of varied knowledge. I almost always learn new things and get inspired to investigat things I didn’t know. Corn is also a good heating fuel. Burns clean with almost no ash. High caloric value too. There are quite a lot of plastics made from wood. Rayon, which was in part invented as a substitute for silk. Celluloid, which was a failure as an ivory replacement, got used for eyeglass frames, radio cases, buttons, all kinds of small boxes, handles for hair brushes and other grooming and cosmetics tools and more. Eastman (no relation to Eastman Kodak) still makes a cellulosic called Tenite. It’s crystal clear and can be colored with various pigments or dyes. I assume they’ve worked out the problem it had in the 1940’s where it would over time discolor going through yellow to dark brown, eventually shrinking and crumbling. While doing that it would also develop a most horrific stench, like someone vomited in a well used litterbox, then deposited a dead rat in there for good measure. I print with PLA for now because it’s cheap, it doesn’t stink up my house like ABS and the temperatures required won’t melt my hotend (not yet all-metal) like PET-G would. That’s why I intend to build an enclosure, air filter and upgrade my hotend soon. I can definitely see using PLA for medical implants but I am no doctor. Beyond that I don’t take PLA seriously. I see some commenters talking about CO2 seem to think making things out of PLA is a good way to “save the world”. I don’t think so. I just don’t understand how a plastic that will go soft and bend out of shape in a hot car or a dish washer can be taken seriously as a construction material. Yes, I know there are some special PLA formulas out there that are supposed to have higher glass transition points. They are much more expensive than alternatives though. Also, what was added to them to change their properties? Are they food safe? Are they still more environmentally friendly than other kinds of plastic? Give me a cheap bioplastic with temperature handling properties closer to those of ABS and I’ll start to get excited! An earlier attempt at bioplastics was genetically engineering corn to grow plastic granules in its kernels. The experiments were successful in getting corn to grow plastic, but extracting the granules was difficult and objects molded from the plastic were brittle. That line of research came to a halt when someone thought to process corn oil like crude oil. Other vegetable oils can be processed into plastics. International Harvester’s newest combines have plastic body panels made of foamed polyurethane made from soybean oil.